Hans Nieschulz is an Arizona born musician. He started playing drums and guitar at ten and played an original composition at a talent show by age 12. As a self-taught musician he played music by ear throughout his teen years and played in a numerous bands and played all over the state of Arizona winning three battle of the bands with original compositions. As an adult he studied music theory classical guitar and Flamenco, under Chuck Hulihan at Glendale Community college. 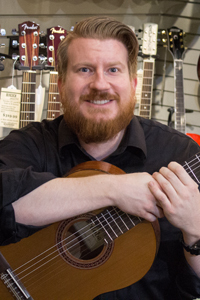 He won the first place two years in a row at the Maricopa county community college music competition with his professional guitar octet, and in 2014 won first place in the Guitar foundation of America competition in the category of college large ensemble. The GFA is an international guitar competition for classical guitar and is regarded the largest in the world. Hans's teaching style is relaxed and easy going with an emphasis on technique and form but tailored for each student. If you have a question for Hans, or wish to contact her, please fill out the form below. The message will be passed along to the Education Center and they will get back to you.